Page 2 ST. JOHN THE BAPTIST CHURCH BULLETIN Mass Intentions for the Week . . . MONDAY 27-- Deceased Anton Dornhafner Deceased Fred Theis Deceased Arthur Logan TUESDAY 28-- For the Parish Deceased Clara Ritzman Deceased Bernard Mentrup WEDNESDAY 29-- Deceased Joseph M. Miller Deceased Catherine Weingart Deceased Mary Frances Hauser, Requiem High Mass THURSDAY 30-- Deceased John Lewis Deceased Matthias Diederich Deceased Bertha Krasuski, Requiem H. Mass FRIDAY 31-- Deceased Wm. C. Murphy, Anniversary Deceased John Tressel Deceased Mildred Sander SATURDAY 1-- For the Parish Deceased Mrs. Catherine Knaup Deceased Jennie Thibedeau SUNDAY 2-- For the Parish For the Altar Society Deceased Arthur Kolz, Anniversary ----------------------- Order of the Masses for the Week . . . MONDAY 27-- Violet. Vigil of Simon and Jude. 2d oration of the Blessed Mother. 3d for the Church or the Pope. TUESDAY 28-- Red. Feast of SS. Simon and Jude. Gloria, Credo, Preface of the Apostles. WEDNESDAY 29-- Green. Mass of the Sunday. 2d oration of the Saints. 3d ad Lib. THURSDAY 30-- Green or black. Mass of the Sunday. 2d oration of the Saints, 3d ad Lib. FRIDAY 31-- Violet. Vigil of all Saints. 2d oration in Honor of the Holy Ghost, 3d for the Church or the Pope. SATURDAY 1-- Feast of All Saints. Gloria, Credo, Common Preface. SUNDAY 2-- Green. Gloria, Credo, Preface of the Trinity. 2d oration of the Octave of All Saints. Next Friday is the day of fast and abstinence. Only one full meal is allowed. About two ounces of bread and a cup of coffee for breakfast and one fourth of a regular meal in the evening. 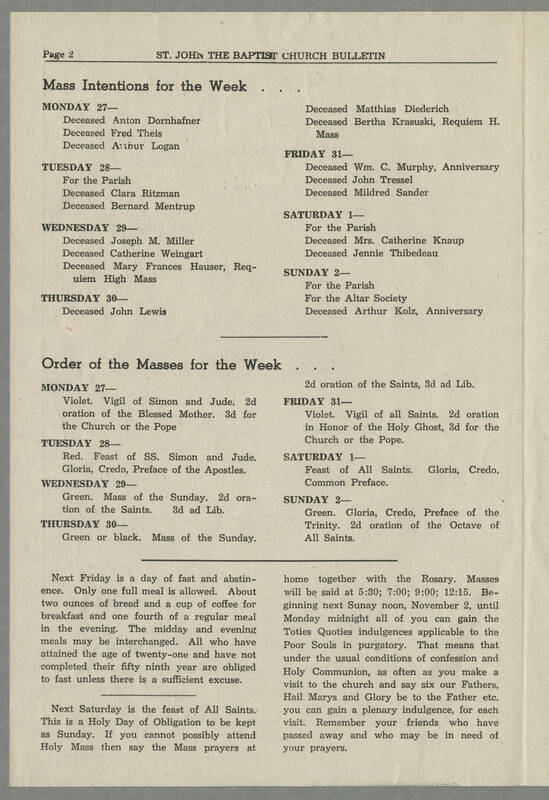 The midday and evening meals may be interchanged. All who have attained the age of twenty-one and have not completed their fifty ninth year are obliged to fast unless there is a sufficient excuse. Next Saturday is the feast of All Saints. This is a Holy Day of Obligation to be kept as Sunday. If you cannot possibly attend Holy Mass then say the Mass prayers at home together with the Rosary. Masses will be said at, 5:30; 7:00; 9:00; 12:15. Beginning next Sunday noon, November 2, until Monday midnight all of you can gain the Toties Quoties indulgences applicable to the Poor Souls in purgatory. That means that under the usual conditions of confession and Holy Communion, as often as you make a visit to the church and say six our Father, Hail Marys and Glory be to the Father etc. you can gain a plenary indulgence, for each visit. Remember your friends who have passed away and who may be in need of your prayers.